After almost two full growing seasons, the pink velvet banana (Musa velutina) has grown quickly! This year Virginia started off cool and ended dry, and despite giving the plant no special treatment other than a feed of fertilizer in the spring and treating for the dreaded Japanese beetles, the banana grew several pups and flowered! 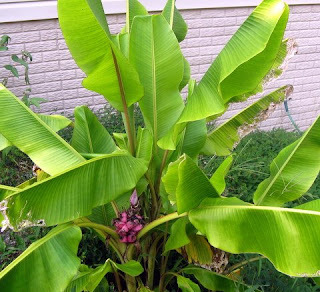 I am convinced this banana is quite hardy and a (perhaps the) perfect tropical for gardens in Virginia and the surrounding mid-Atlantic region. As the first frosts have come in gone, it's important to winterize your tropicals before the ground freezes. Many tropicals can survive cold weather, but very few can survive their roots freezing! You can see how I winterize my tropicals in my post about winterization. 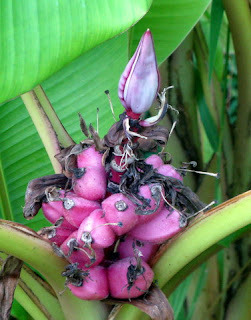 I have been scouring the net to find gardeners in the good old US that grow tropical plants outside. In the UK we call them exotics. I wrote a book for Timber press entitled The Encyclopaedia of Exotic Plants for Temperate Climates. We do not have zones here, though I am probably about zone 8ish and warmer in mild winters, in saying that though, we have just had our coldest winter for 18 years. Keep up the good work and write some more posts.